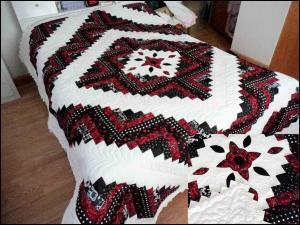 Beautiful black/white (with red contrast) quilt. Queen size - 84 inches x 103 inches. Will bring to life a bedroom with the rich looking colors. Great for wedding gift, office staff group gift etc. White points around quilt edge. Will show gladly.